Director – Shane Black, Screenplay – Shane Black & Fred Dekker, Producer – John Davis, Photography – Larry Fong, Music – Henry Jackman, Visual Effects Supervisors – Jonathan Rothbart & Matt Sloan, Visual Effects – Atomic Fiction (Supervisor – Ruslan Borysov), Hydraulx, MPC (Supervisors – Arundi Asregadoo & Richard Little), Raynault VFX, Rising Sun Pictures (Supervisor – Tom Wood), Special Effects Supervisor – Alex Burdett, Creature Effects – Alec Gillis & Tom Woodruff, Jr., Makeup Effects – Mastersfx Canada, Inc. & Quantum Creation, FX, Inc., Production Design – Martin Whist. Production Company – Davis Entertainment. A Predator ship crashes in South America. Special Forces soldier Quinn McKenna is on a mission nearby and sees it come down. Quinn goes to the site where he retrieves the Predator’s helmet, gauntlet and the sphere that allows it to become invisible. He swallows the sphere and mails the rest of the equipment back to his ex-wife Emily in the US. Quinn is then taken into custody by government agents who are certain that he saw something. Meanwhile, evolutionary biologist Casey Brackett is recruited by the agency to examine a Predator that was captured from the crash site. Back in the US, the package is opened by Quinn’s spectrum disorder son Rory who manages to activate the gauntlet and then takes the helmet to wear as a Halloween costume. The Predator breaks out from confinement and slaughters most of the scientists. Just as this happens, Quinn is being taken away in a bus along with several other servicemen who have all been sentenced for various crimes or mental health issues. Quinn quickly marshals the other prisoners to fight back. Realising that the Predator is heading after Rory to get its equipment back, he organises the men and they set out to stop it. In the midst of armed battle that ensues. a new threat arrives – that of a new breed of Predator that has used human DNA to become a bigger and more vicious fighting machine. The original Predator (1987) was a muscular Arnold Schwarzenegger action film that was made riffing on the success of Aliens (1986). It was no more, no less than a big action comic-book of the sort that Schwarzenegger spent the 1980s making – nobody at the time would have predicted that it would become a franchise that is currently in its fourth decade of operation. This was sequelised with Predator 2 (1990). A Predator 3 was rumoured for several years after but never went ahead and the original film series seem to come to an end at that point. The Predator did however continue in various novels, videogames and in particular a comic-book series that included several novelty crossovers in which the Predator fought Batman, Judge Dredd, Tarzan and even ventured to Riverdale to meet Archie. The most famous of the comics was Aliens vs Predator, which became a popular title in its own right. The copyright of both the Predator and Aliens series was held by 20th Century Fox and the potential for an on-screen crossover led to much fan mill speculation and a host of spec scripts. This eventually culminated in the films AVP: Aliens vs Predator (2004) and AVPR: Aliens vs Predator Requiem (2007), which were fairly much hated by fans of either series. The regular Predator series was then revived with Predators (2010) and a second time here. 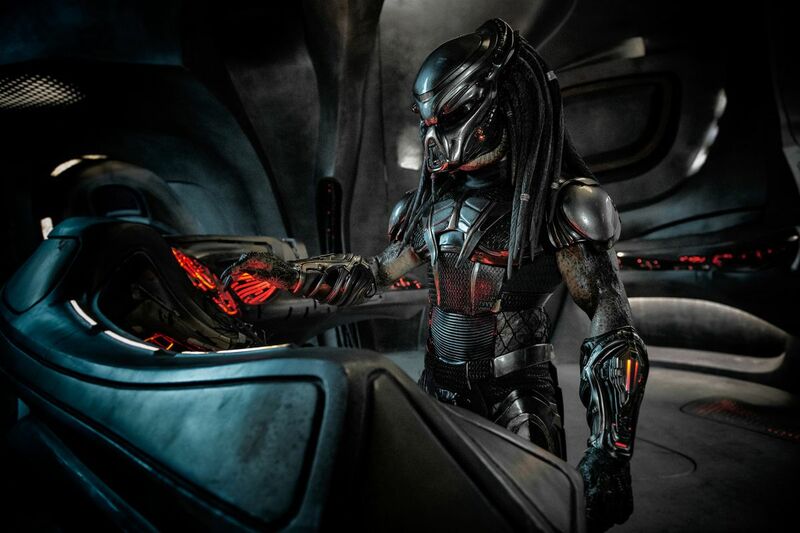 This latest revival of the Predator franchise has been placed in the hands of Shane Black. This is an interesting choice in that Black had actually appeared as an actor in the original Predator (playing one of the soldiers) way back at the time when he had only just had his just sold his first script – for the Mel Gibson hit Lethal Weapon (1987). Over the next decade, Black went on to write scripts for The Monster Squad (1987), The Last Boy Scout (1991), Last Action Hero (1993) and The Long Kiss Goodnight (1996). Black made his directorial debut with the quirkily appealing modernised film noir Kiss Kiss Bang Bang (2005) and then went on to make Iron Man Three (2013) and another quirky buddy cop film The Nice Guys (2016). Here Black shares scripting duties with his friend Fred Dekker, a former classmate at UCLA who directed the likes of Night of the Creeps (1986) and the Black-scripted The Monster Squad before his career nosedived with Robocop 3 (1993). Shane Black has for the most part delivered solid and standout work as both director and screenwriter – even if one might forgive him for Iron Man Three. Certainly, he has done so on a consistent basis that there was a surprising cult cheering him on with the announcement of his directorship of The Predator. Thus it is that one looked forward to him reinvigorating the franchise after the troughs of the Alien(s) vs Predator crossovers. Black does introduce some interesting things into the series, even if I don’t think he is fully successful. For one, he respects continuity to the other films – mentioning The Predator’s previous appearances in 1987 and 1997 (the date that Predator 2 was set) and showing photos from either film. (Notedly, he does not include continuity calls to any of the Alien(s) vs Predator films). And he takes to this with a certain degree of amusement – the government agents nickname the creature a Predator whereupon characters on several occasions point out that the creature is technically not a predator at all. Black is willing to shake up the series in an effort to inject new ideas into it. We get a Predator captured and undergoing examination in a government laboratory (even if the only thing it promptly does is break out). One of the more interesting ideas is having Boyd Holbrook retrieving a Predator gauntlet, invisibility sphere and helmet. In an amusing twist, the package is opened by his young son (Jacob Tremblay) leading to the appealing image of the kid going trick-or-treating wearing an oversized Predator mask, whereupon a drunken yahoo throws a beer can at him which promptly activates the helmet’s automated defences that blow up his house. (You also have to applaud Black for featuring a spectrum disorder kid in a positive and sympathetic portrayal). The latter half of the script introduces some wilder and far more science-fictional ideas to the mix – Predator dogs, a super-Predator that eliminates the regular one they have been hunting and is revealed to be genetically engineered from human DNA, although by the time of the arrival of the Predator Killer device in a slingshot ending, this does seem to be getting a little silly. The film goes in more predictable directions during the latter third where Black allows the action element to take over. This is okay, although mostly consists of shooting and blowing things up often with an emphasis on the spectacular – notedly a climax with Boyd Holbrook trapped under the force shield of a Predator craft as it takes off – than the bared Man vs Predator battles that we had in the first two films. (Not to mention comes with the improbability of the facility where The Predator is being examined by scientists, the holding area that the prisoners are being transferred from and Boyd Holbrook’s home all seeming to exist within a stone’s throw of one another). Black does have a good deal of fun with the characterisations of the unruly Dirty Half-Dozen that Boyd Holbrook corrals together to the fight The Predator – characteristic of Black’s films, much of this is focused on witty banter and interplay between them. It makes for an enjoyable enough film, even if it is one where you feel that Shane Black is batting beneath the game he is far more capable of on his better days.